As in past years, in 2010 we used the vacant lot for performances and demonstration classes before the sun went down. 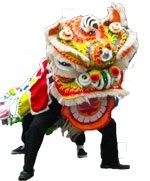 Before Thursday’s film (8/26/10), we watched a lion dance at 7:45PM by Gund Kwok, the only Asian Women Lion & Dragon Dance Troupe in the United States. Before Friday’s film (8/27/10), we watched a lion dance, a demonstration class, and a Kung Fu demonstration from 7:15 PM to 7:45PM by the Wah Lum Kung Fu Athletic Association. Before Saturday’s film (8/28/10), we watched a Tai Chi demonstration from approximately 7:15 PM to 7:45PM led by members of Bow Sim Mark Tai Chi Arts Association. Every Night: WALKING TOURS 6:00-6:45PM, THU-SUN 8/26-29. Explore Chinatown on a special 45 minute walking tour led by youth from the Asian Community Development Corporation. Get an in-depth look at Chinatown and its transformations over time, and connect with dynamic community workers who are working to preserve and revitalize this unique community. Learn about Chinatown’s unique urban environment, visiting historic sites that serve as connection points across generations and languages. Suggested donation $5, all proceeds support Asian Voices of Organized Youth for Community Empowerment (A-VOYCE). Meet 6PM at the Chinatown Gate (Google Map). For more information contact avoyce@asiancdc.org. Donnie Yen, Nicholas Tse, Simon Yam. Director Teddy Chen. Choreography Wei Tung. An all-star cast in a stirring action adventure, the story is loosely based on a visit to Hong Kong by Dr. Sun Yat-sen, the first president of China, in 1906. The Manchu government sends assassins to wipe out the revolutionary leader, who is protected by an informal alliance of partisans and martial artists. Starring Boston’s own Donnie Yen. Best Actor (Wang Xueqi), 4th Asian Film Awards. Best Actor (Wang Xueqi) and Film of Merit, 16th Hong Kong Critics Society Awards. Best Film & Director, 29th Hong Kong Film Awards. Read more about Boston’s own Donnie Yen who stars in this film. Jackie plays a trouble-prone teenaged version of the martial hero Wong Fei-hung, but he meets his match in the Drunken Master (played by director Yuen Woo-ping’s father). This is considered one of the best kung fu movies ever made. Learn more about Drunken Master from Films at the Gate Curator, Jean Lukitsh. As we have in past years, Friday’s film will be preceded by a lion dance, a demonstration class, and a Kung Fu demonstration from approximately 6:30 PM to 7:30PM by the Wah Lum Kung Fu Athletic Association. Check out this great post by curator Jean Lukitsh about the real Drunken Master. Animated film directed by Wan Laiming, Wan Guchan, and Wan Chaochan. The Wan brothers were China’s version of Walt Disney. 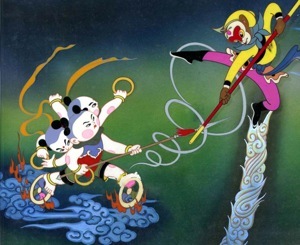 Starting in 1922, the brothers made a series of short cartoons, then created the first animated Chinese feature film, PRINCESS IRON FAN, in 1940. HAVOC IN HEAVEN, a fantasy based on the Monkey King epic, is their best known work. Saturday’s film (8/28) will be preceded by a Tai Chi demonstration from approximately 7:00 PM to 7:30PM led by members of Bow Sim Mark Tai Chi Arts Association. Starring Cindy Cheung, Michael Chen, and Crystal Chiu. Directed by Tze Chun. Two young children living illegally in a model apartment outside Boston are left to fend for themselves when their hardworking mother disappears. 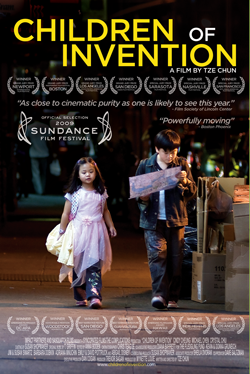 Filmed in Boston’s Chinatown, CHILDREN OF INVENTION made its world premiere at the 2009 Sundance Film Festival, played over 45 film festivals, won 16 festival awards incuding 7 Grand Jury or Best Narrative Feature prizes, and was released theatrically in 8 cities in 2010. Film web site.